^ Kwon, Heonik. 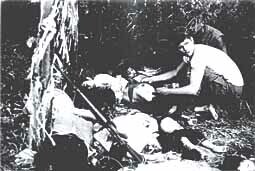 After the massacre: commemoration and consolation in Ha My and My Lai. University of California Press. p. 32. ISBN 9780520247970. Heonik Kwon (2006). After the massacre: commemoration and consolation in Ha My and My Lai. University of California Press. ISBN 0520247973.